Intredium offers five basic types of services to clients. These offerings are designed to complement each other; we offer complete support and consultation for all projects, from initial design to training after your solution has been crafted. Make your business technology systems more efficient, effective, and secure today with a custom solution from Intredium. Business Intelligence is as much about management discipline as it is about technology. Meet your strategic goals by implementing a BI solution. When working with complex integrations, appropriate technology application is required to make sure your business outcomes are achieved — the staff at Intredium are integration experts. Give your business processes the support they need! Custom application development can help drive your business functions to success. Get the increased performance and flexibility that comes with moving over to the Cloud. 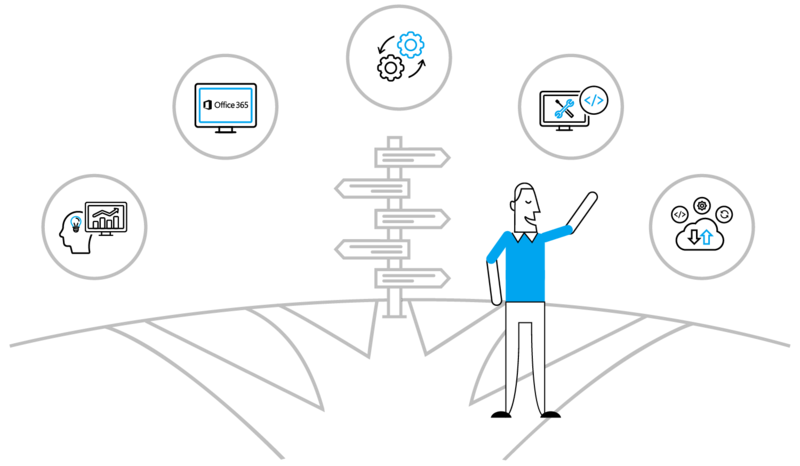 As a Microsoft partner, we’ll make sure you understand everything the Cloud has to offer your business. Our experience has made us masters of business communication platforms, from Skype to enterprise-class email. Our Microsoft client collaboration solutions are second to none.